This beginner's guide will tell you all you need to know while creating your website for the first time. You can create and modify every aspect of your website with our drag and drop functions and easy to use interface. Lets begin! First, you will have to create a Zoho account to access Zoho Sites. The account that you create is free of cost. Go to sites.zoho.com and click the Sign Up Now button on the top right corner. Enter your email id and a password. The password that you enter will be your Zoho account log in. Your Zoho account will be created. You will be able to access Zoho Sites and all Zoho services using your common Zoho account. Note: You will receive a verification email after your account has been created. Confirm this email to activate your account. You will not be able to publish your website unless this email is confirmed. Now that your account has been created, the first step to building your website is to select a theme from the gallery. You can choose a theme from the list of categories on your left. Click a theme category from the menu on the left. Hover your mouse over the theme of your choice and click Choose. Themes can be changed at any time without affecting your content. Hover your mouse over the theme of your choice. Click Apply or click Preview to have a look at the theme before you apply it. Click Apply if you like the theme that you have previewed. Click Try Another if you would like to look at another theme. Next, you will have to name your website. By default, your sites name will be "Site Title". Enter the name of your site in the Site Name text box. Note: You can also choose to hide your site name. Click Hide under the Site Name text box. Now, you can start creating your website. You can customize properties such as font size, font color, background color, designs and much more without having to use any complex code. It can be done simply by accessing the visual editor and clicking the desired properties. Choose sections from the menu on the right. Use the dropdown lists to choose your customization options. Click Save and Close once you have finished. Note: Click the Desktop and Mobile buttons at the top of the editor to switch between Desktop and Mobile view. If you are an advanced user, you can use the HTML/CSS editor to code your customizations. Choose properties below the Desktop and Mobile sections on the left. 4. Click Save and Close once you have made your edits. Once your design customization is complete, you can continue creating your website by adding various kinds of content using the elements provided in the Elements tab of your site builder. You can add text, images, buttons, audio, and video, to name a few, to your webpages. It can be done simply by dragging and dropping the element from the Elements tab to the content area of your page. 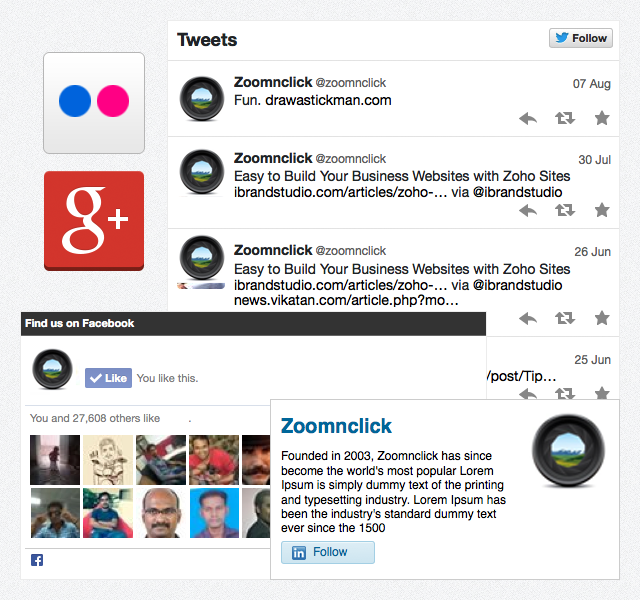 You can add third-party apps like Facebook, Twitter, LinkedIn, Google+, Flickr and Google+ photos etc. in your website to interact with your visitors using various channels. For example, by adding the Facebook widget to your site, your visitors can interact with your Facebook page without having to leave your website. They function as a separate pages from within the page. 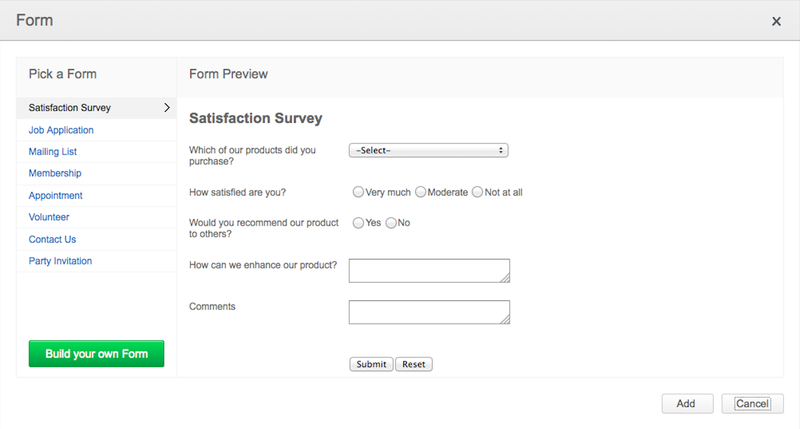 You can create forms to collect data from your website visitors. It can be just the email IDs or the leads/contacts for your Zoho CRM or any of your custom requirements. You can also enable email notification for those forms, which will trigger an email to the set email address when someone enters data. Blogs are the best way to engage your website audience and like-minded visitors. Blog is an abbreviation of the word web log and is often used as an online journal that you can open up to comments from others. You can create a blog and publish posts just like you create and design a web page. 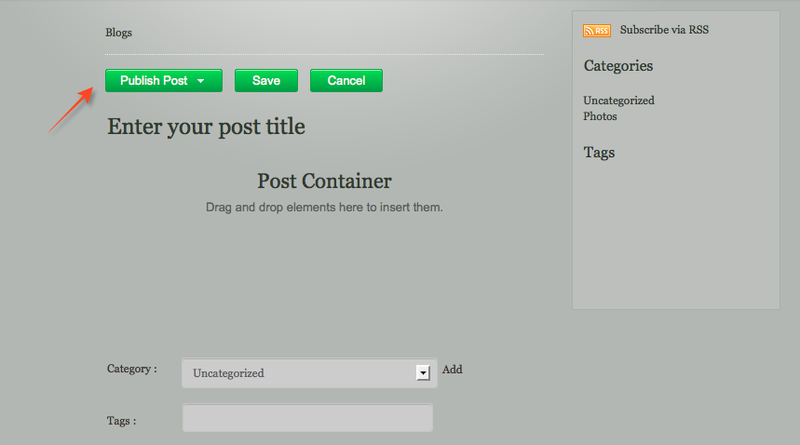 Here too, you can drag and drop any element that you want into the blog. Every theme has a sidebar and a footer. You could add any element like social media buttons, payment buttons or an image slide-show to the sidebar and footer that you would normally add to the content area. You also have the option to display or hide sidebar in your webpage. You can also create custom sidebar if you want the content in the sidebar to be different from one page to another. After you have created every aspect of your website, you are now set to open it up for your visitors. But before you do that, you need to make sure that everything is in place, as intended. For that you can preview your website anytime during the process of creation and check how it would appear to a visitor once it is live. 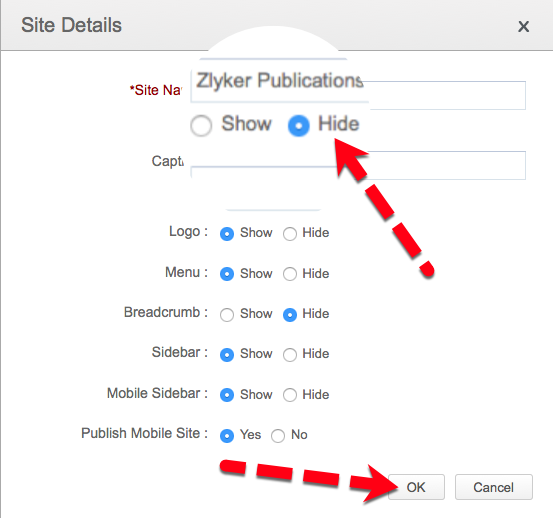 Move your mouse over the Publish button at the top right corner of your site builder and choose the Preview options. Here, you can see how your website would look on a full size web browser, and also on a mobile phone. Zoho Sites automatically generates a mobile-optimized version of your website, without you doing a thing extra. The last step to be done with your website is a domain name. Domain name is the unique URL that a visitor accesses on a browser before he lands on your website. It is extremely important that you treat the domain name as you have treated your website. Domain names are a big deal, and here are some points to ponder when picking a domain name. You can go with the free subdomain of zohosites.com, or use a custom domain that you might have registered already. If you don't have one yet, you can register one now with Zoho Sites. You can publish your website after you have finished designing it. Users will be able to visit your website regardless of the device they are using. You can publish your website and subsequent edits simply by clicking the green Publish button at the top right corner of your site builder. You will need a domain name before your site goes live. An ideal domain name would be one which is specific to the nature of your website. If you do not have a domain already, you will need to configure one. Using Google and Bing webmaster tools will help increase your websites online visibility. Making it easy for search engines can find your website. 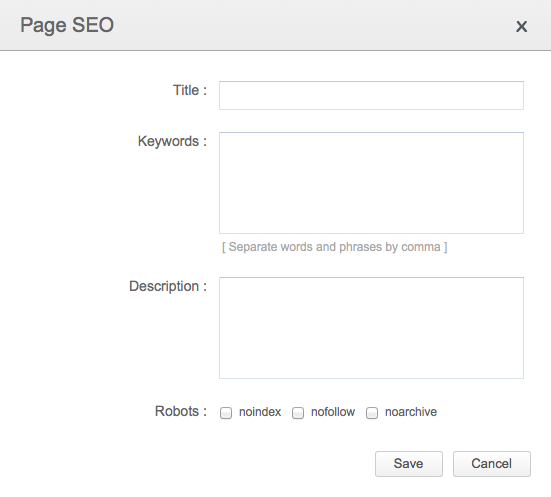 Search engines use robot text to crawl on your pages and index the contents so that the visitors can easily find relevant content that they are searching for. There is no way a visitor would know your domain name as soon as you publish your website. That is where SEO comes into picture. Search Engine Optimization is your digital marketing tool where you can tweak your web content in such a way that when users search for related terms on various search engines like Google and Bing, your website appears at the top of the search results. The more relevant your content is, the higher your website appears in the search result and more people visit your website. Zoho Sites allows you to optimize your web pages to rank higher on these search engines, and therefore, get found by more people, easily. Alright! You have created your first website with us. Quite simple, wasn't it? But if you ever find yourself in a fix, do not hesitate to contact our 24/5 support team. Feel free to write to us at support@zohosites.com.